Open Work is a daily opportunity for children to engage in self-initiated work with a range of materials. In the 4s, the unit blocks, easel paints, water table, and clay are always available. Through extended experience with those open-ended materials, the children’s work develops in complex and often surprising ways. Students make discoveries about mixing colors or balancing tall buildings. They are deeply invested in the dramatic play that evolves around block buildings and clay, and tell elaborate stories to accompany their paintings or work at the water table. They move fluidly between materials and activities, finding opportunities to work independently or with peers. Most important, children experience the satisfaction of making their own choices and following their own ideas. In the 5s and 6s classrooms, children learn to stay with their Open Work choices for longer stretches of time, beginning to return to work over several days. Their repertoire expands to include activities like bookmaking, cardboard construction, science experimentation, and puppetry. 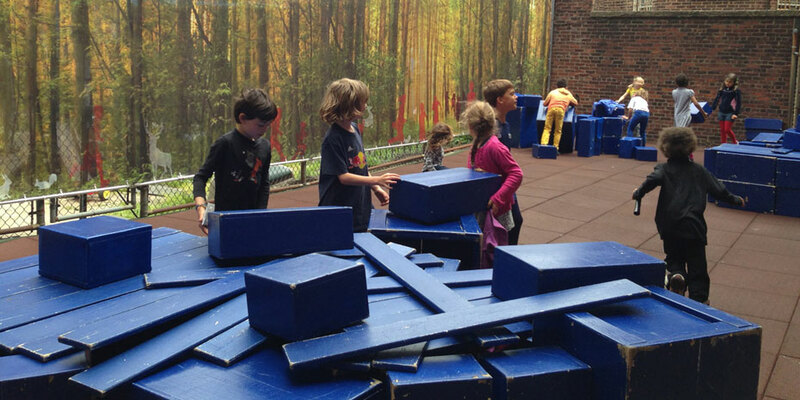 The explorations and creations of Open Work in the early childhood classrooms set the stage for continued self-initiated work throughout the Lower School, as children acquire the ability to manage more complicated projects. Encouraged to share their ideas with classmates, they become increasingly comfortable giving and receiving feedback and reflecting on their own work. 5s and 6s participate in Labs, ten-session mixed-age mini-courses focused on topics and interests like tinkering, insects, sculpture, and newspaper. Children bring ideas and skills that they’ve learned in Labs back to their classrooms. Open Work is an important part of our academic program, providing daily opportunities for students to exercise choice and take ownership over their work. Sometimes Open Work is focused on a particular curricular area or topic. Students might create books or perform plays, or design scientific experiments. At other times, students are able to incorporate skills they have learned in new ways, for example, by applying research skills to their own areas of interest, teaching classmates a new craft, or extending work done in technology class to their own projects. Multi-age Labs provide another arena for students to acquire new skills and pursue interests. Labs convene around topics like engineering, poetry, or jewelry, allowing for the development of core skills in novel ways. The experience students gain in Labs deepens the work they do back in their classrooms during Open Work. As students get older, greater emphasis is placed on planning independent or group projects during Open Work and articulating the standards by which they believe projects ought to be evaluated.